Donegal ETB is one of the leading providers of welding and engineering training within the Irish Further Education and Training (FET) sector, providing a wide range of courses in this field that allow learners to progress from basic to intermediate to a career traineeship. However, while welding has a reputation as a male-dominated trade, Donegal ETB provides a supportive environment for female learners to undertake this training and we recently spoke to one of our female welding learners, Laura Mulkeen, who discovered her true calling at the age of 33. Laura spent more than ten years working in Event Management in Dublin and Belfast but when she had to relocate to Donegal for family reasons, she found herself unemployed and needing to work out her career direction. She never felt fulfilled with Event Management but knew she liked being creative and was attracted to the craft industry. She started doing some blacksmith work in West Donegal and signed up for one of our Basic Welding courses in 2016 which really confirmed her career path for her. Laura has now also completed Intermediate Welding and plans to also complete Coded Pipe Welding. 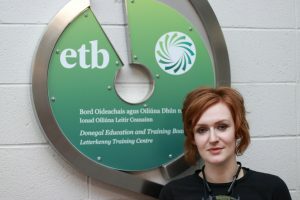 Laura recommends women who choose crafts or trades to link in with Women in Trades Network, Ireland. She recognises the fear women face entering into a male-dominated work area and she applauds the support of the Network. If this is an area that interests you, check out the range of courses starting in January and February 2019 on www.fetchcourses.ie using the keyword ‘welding’ and apply online today. Specific Skills Training is co-funded by the Government of Ireland and the European Social Fund as part of the ESF Programme for Employability, Inclusion and Learning (PEIL) 2014-2020.